When things go wrong Jean Quick and her small, dedicated team of volunteer wildlife carers spring into action. Many of the animals brought into care are victims of road accidents some with quite horrific injuries, others have shotgun wounds, burns or other injuries often caused by barbed wire or illegal traps. Many will recover with the proper care and medical treatment and can be released back into wild. Sadly some don’t make it, but you can be sure they are treated humanely and handled with love and respect. The local wildlife population suffered severe losses in the 2009 Boolarra bushfires and Jean found herself overrun by animals in need, but the population is gradually recovering and with Jean and the other carers' help, will prosper once again. 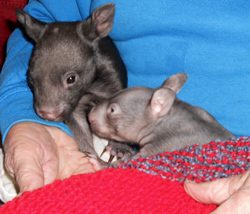 The aim is to produce a 50cmx50cm square suitable for wrapping a baby wombat. The carers can also join these squares to form a 'joey bag' if needed (please send individual squares though so the carers can make them up to suit their current requirements). Do not bother with a tension square. Simply produce a diamond shape with edge 50cm. Baby wombats rescued from their dead mothers pouches are often completely hairless and breathe through the fabric of their blankets so they don’t lose valuable heat through their tiny heads. For this reason the blankie must be of pure wool and needs to be machine washable (they’re not toilet trained either)! The instructions below are written for 8ply wool, but you can use any ply; just adjust the needle size accordingly. Use any colours you like: bright, striped, plain or otherwise; feel free to get creative! Using 8 ply wool and 4mm needles cast on 2 stitches. Knit through front and back of 1st stitch (to make a stitch). Knit to end of row. Repeat this row until edge of work measures 50cm. Next row: K2tog, K to end of row. Repeat this row until 2sts remain. K2tog. Draw yarn through and fasten off. 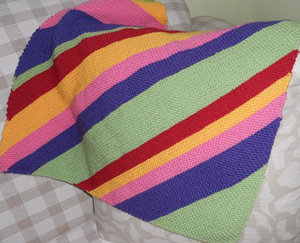 ​You can send your completed Womblankies to us here at Knitting Yarns by Mail, as we are in regular contact with Jean from 'Jean-e-us' Wildlife Shelter. Our postal address is 114 Fox & Fanckes rd, Boolarra Sth 3870. Thankyou so much for your support of this worthy cause. Many thanks to the Churchill Neighbourhood House Wednesday knit and crochet group for their help with this project. Special thanks to Bronwyn for the pattern and Lyn for knitting our sample so beautifully. 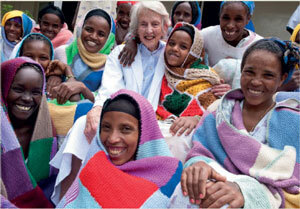 Knitting Yarns by Mail is proud to support Hamlin Fistula Ethiopia (Aust); a charitable organisation founded by obstetrician Dr Catherine Hamlin AC to raise awareness and much needed funds to treat poorer Ethiopian women suffering from childbirth injuries, specifically obstetric fistula. Hamlin Fistula Ethiopia runs the Addis Ababa Fistula Hospital, five provincial fistula centres, the Hamlin College of Midwives and Desta Mender, a farm and training centre. Hamlin Fistula Ethiopia aims to provide an holistic approach to the treatment of women suffering from the horror of obstetric fistula, and give them back their dignity. In addition to being admitted to hospital and receiving surgical treatment completely free of charge, patients are also provided with literacy and numeracy classes, a new dress and money to travel home. Hamlin Fistula now has an oversupply of blankets for the patients; thankyou so much for your help with this! Hamlin Fistula now ask knitters and crocheters to donate items they can sell in their Sydney store, with the much-needed funds supporting their work in Ethiopia. Alternatively, you can organise to sell your knitted items in your local area and donate the proceeds to Hamlin Fistula. For further details, visit their Fundraising for Hamlin Fistula page. Thankyou for your support of this deserving charity.